1. I confess, I don’t have the greenest of thumbs; a fact which saddens me but in no way dampens my gloriously green aspirations. This unreasoned continuance of hope is why every year, oblivious to all past failure, I try to grow things. While I still haven’t had much in the way of success - I think I can number the spoils of my efforts to a total of six beans and one clump of somewhat weedy lettuce - every year I make it a little farther. I am really quite certain that one year, I will prevail. To that end, come about March I begin reading and re-reading every gardening book I can get my hands on, which is why, even if I’m not a master gardener yet, one thing I know for sure is that you have to plan well in advance and even start your seeds indoors if you plan to have any success with a garden. And believe it or not, the time is already upon us for many indoor starts. According to the farmer’s almanac, Indianapolis' final frost date is April 18th. More than likely, you won’t be putting anything in the ground before then, but lots of things should be started indoors as early as February. Here is a handy chart for start times of common veggies, as well a PDF you can print and make your own! One of my favorite books on the subject is Little House In the Suburbs by Caswell and Siskin. I use and re-use it as a resource. I know that most of the garden stores in Indy have old plant trays they can sell you for seed starts. I paid pennies for mine last year at Habig in Broadripple. 2. Another annual necessity is the refreshing of the mulch in your landscape. Did you know that Indianapolis mulch is easy to come by, via The Mulch Monkey? You can shop for the right kind, calculate and order, all online and they’ll deliver it where and when you want it. It doesn’t get much easier than that. Now, if only there were actually a tribe of monkeys included to come spread it for you! Even if not, I always find that by winter’s end any chore that keeps me outdoors in the beautiful weather is welcome. Spread your mulch approx. 3” deep. This will give it a lush, fresh look and will be deep enough to keep the weed population down, saving you work later. Don’t forget to edge your beds first. Here is a quick video from This Old House on creating a natural landscape bed edge, which will eliminate the need for those plastic borders and keep the mulch from spilling out into your lawn. Use a pitch fork and a wheel barrow to get mulch from the pile to the beds and then use your hands or a rake and spread lightly, working from the back of the bed to the front, to keep the mulch light and fluffy. Water in well when finished. 3. Pre-treat your lawn for pests and weeds. Crabgrass begins to germinate when the temperatures reach 55 degrees, so be careful that it doesn’t get a foothold before you do. You can also treat your yard for pests like fleas before they have a chance to lay a bunch of new eggs. For a natural solution, combine lavender and water and spray it around your yard, especially under and around bushes. 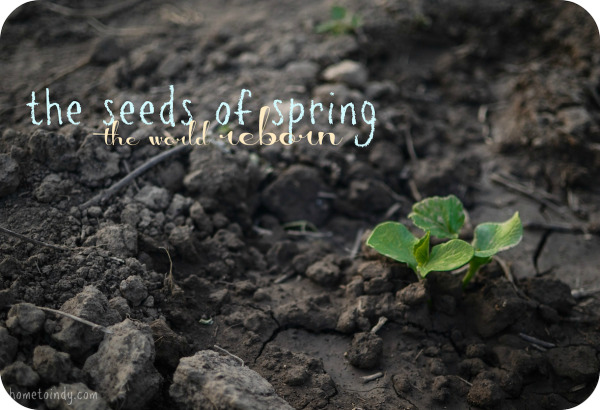 Hopefully these little tips help to germinate the hope of Spring and give you a running start on all of those wonderfully outdoor chores to come.